As you walk through the fascinating new exhibit on the history of the legendary Tyrannosaurus Rex dinosaur (T. Rex to his loyal fans) at New York’s American Museum of Natural History in New York, you hear this endless THUMP, THUMP, THUMP sound. It is the sound of T. Rex charging through the jungle in pursuit of yet another animal as his prey. The big, broody T. Rex, in all of his 66 million years of glory, and such a star on the silver screen for decades, is the subject of a new, brash and bold exhibit at the museum. The exhibit, T. Rex: The ultimate Predator, opened last week at the museum, at Central Park West and W. 81st Street. It tells the 66 million year history of the T. Rex and explains how the huge, vicious two-legged dinosaur with the short arms evolved from a smaller and far less dangerous jungle creature into the much feared King of the Jungle. The new T. Rex exhibit on the third floor of the museum is the crowning touch to the large dinosaurs exhibits at the museum and helps, in an exciting way, to show visitors how all those movies and songs about T. Rex and his fellow dinosaurs emanated from the T. Rex over so many years. Other dinosaur skeletons, fossils and mummies are house in the Hall of Dinosaurs on the fourth floor of the museum. The dinosaur hall has a towering T. Rex, a Ceratosaurus, the Stegosaurus, the Triceratops, Stegosaurus, Mammoth and a collection of fellow dinosaurs whose history stretches back 128 million years. The centerpiece of the hall is the 122’ long Tyrannosaur, found in an Argentina farm a few years ago, a beast whose skeleton is so long that it couldn’t be contained in one hall; his neck and head sticks out into a second hall, like a cartoon character, and is a daily tourist attraction for wide-eyed adults and giggling children. The museum has done a nice job of setting up the T. Rex exhibit. They time the exhibit so the crowds are not large and you select your time when you obtain your tickets. The first few display boards tell you how the T. Rex descended from 24 different T. Rex species over millions of years. He was so big and heavy (around 9 tons) because all he did was eat and grow (he gained 140 pounds a month, and that’s without cookies). From there, you follow the story of how the dinosaur changed over the years. In the early days, the T. Rex was a much smaller animal. The meanest animal that ever lived, a really bad dude, was not mean in the beginning. In fact, don’t tell anybody, he was completely covered in feathers. Yes, feathers. T. Rex now stands at the heart of the dinosaur exhibits at the museum. The reason is because the museum’s curator, Mark Norvell, and his staff have done a painstaking job of making him easy to understand without taking the menace out if him. They have also turned this into a very family-friendly exhibit, one that adults and kids alike can enjoy. And yet, T. Rex still as scary as ever. T. Rex was one of the most intelligent of the dinosaurs and yet, at the same time. mean and nasty. His rage that made him so famous stemmed from injuries throughout his lifetime (most T. Rexes lived until about 34). “He had to go into battle every time he wanted to eat something, and the wounds he suffered piled up and he was always in some kind of pain,” said a tour guide. The best way to see the sprawling exhibit is with a tour guide that you can find somewhere on the floor. The guides gather together a dozen or so visitors and, at no charge, give comprehensive tours discussing the T. Rex. They also answer any and all questions. They are also funny. Mine told a little girl that if a T. Rex gobbled her up she was so small that she would serve only as his “potato chips.” She laughed. It is appropriate that the museum is presenting the T. Rex exhibit because the world’s first T. Rex find was made by the museum’s famous paleontologist and fossil hunter, Barnum Brown. He uncovered the first-ever T. Rex remains in 1902 in Montana. The T. Rex is everywhere in American culture – dolls, stuffed animals, coffee mugs, posters and even in rock and roll songs. T. Rex and other dinosaurs have been a staple of Hollywood movies for years. There have been more than 150 movies centered around dinosaurs, with the T. Rex, the Brontosaurus and others galloping through thick jungles and across meadows. They started in the silent movie era and picked up steam with the first King Kong movie in 1933. They gained wide popularity with all the recent Jurassic Park films (I saw Jurassic World on television just last Tuesday). Along the way there were all the Godzilla dinosaurs, The Land Before Time movies, the Lost Continent and Lost World movies, the Tarzan films, Mysterious Island, and of course, The Flintones (yaba-daba-doo). The exhibit also includes the skeleton of a four-year-old T. Rex, a not so cuddly tyke, dinosaur teeth (pretty big and sharp) and a dozen or so re-created T. Rexes at different ages. There is plenty to do at the exhibit besides stare at old bones. 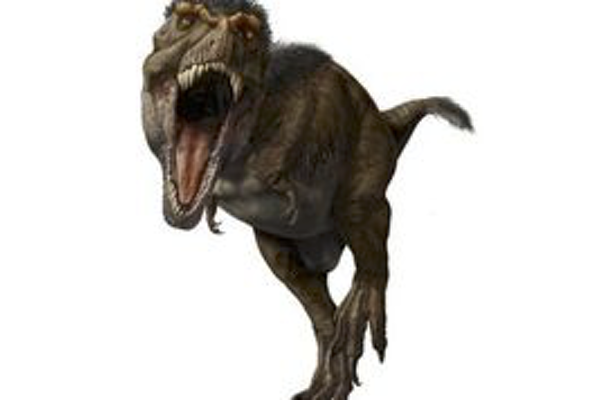 There is a “Roar Machine” on which you can listen to how the T. Rex sounded when he was angry. There is an “investigation station” that shows you various dinosaur fossils. There is a five minute long virtual reality show viewed with a mask in which you see the world as the dinosaurs saw it. There is a really neat, wall sized animated movie of a T. Rex rumbling through the jungle. You walk or run in front of it and the dinosaur follows your motion and chases you, roaring like mad and thumping away with his huge paws. If you love dinosaurs and/or being chased by one, this is the exhibit for you. Bring the kids. The American Museum of Natural History is at Central Park West and W. 81stStreet. The museum is open daily, 10. A.m. to 5:45 p.m. It is closed on Thanksgiving Day and Christmas Day. The exhibit runs through August 9.